16 Small dinner rolls, 2" x 2"
Pour the pasta sauce in a small sauce pan, add the meatballs, cover and heat over medium heat for 8 - 10 minutes. Gently stir to coat the meatballs with the sauce. 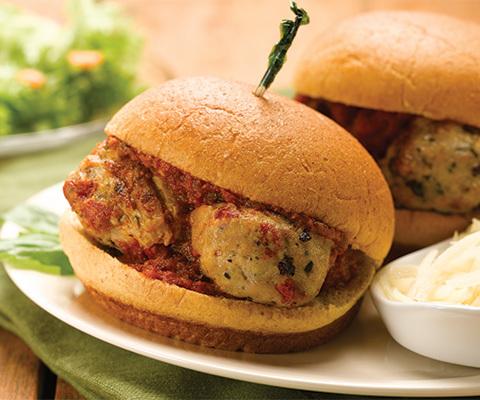 Slice the small rolls in half, and place a tomato & basil meatball in each roll. Assemble on a serving platter. Top each meatball with a dollop of the remaining heated pasta sauce. Garnish with sprigs of fresh basil and serve immediately.